Founding Galleries Include James Cohan Gallery (pictured), Gagosian Gallery, David Zwirner, Hauser & Wirth and White Cube. NEW YORK, NY.- VIP Art Fair, the first art fair to mobilize the collective force of the worlds leading contemporary art galleries with the unlimited reach of the Internet, announces its inaugural fair taking place exclusively online for one week only, January 22-30, 2011, at www.vipartfair.com. An unprecedented event, VIP Art Fair gives contemporary art collectors access to artworks by critically acclaimed artists and the ability to connect one-on-one with internationally renowned dealersfrom anywhere in the world and without leaving home. The revolutionary design of VIP Art Fair allows art collectors the opportunity to view artwork online as never before. VIP Art Fairs innovative technology presents artworks in relation to other works of art and in relative scale to the human figure. Inquisitive visitors can zoom in to examine details of a paintings surface, get multiple views of a three-dimensional work, and watch videos of a multimedia piece. Galleries will provide comprehensive details on artworks and artists, including biographies, catalogue essays, artist films and interviews, and in-depth information that will empower collectors. One of the many distinct features of the Fair is the interactivity between dealer and collector. Each dealer has the ability to hold conversations with collectors via instant messaging, Skype, and telephone to discuss works on offer in the virtual booth. 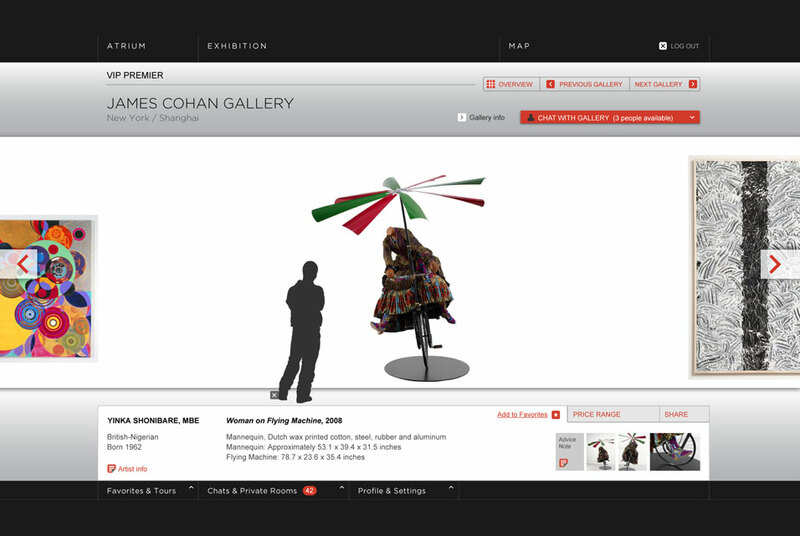 Dealers can also provide access to their gallerys back room inventory, sharing works in real time with clients in specially-created Private Rooms on the clients own computer screen. There are many ways to explore the Fair, including online tours which are core to the VIP Art Fair experience. Visitors to the Fair can choose from a wide selection of tourswhether of featured works or a tour created by collectors, critics, and curators from participating museums. Visitors also can design their own personalized tours of the Fair that showcase their favorite works and can be shared with friends or posted in the VIP Lounge. Other ways to navigate the site include the Fair Map and advanced searches based on criteria of interest, such as artists name, medium, or price range. The VIP Lounge is where visitors can watch specially commissioned films of leading private art collections and artists studios, check out Fair tours created by other visitors, access status updates on art market news, and learn about new works on view in the Fair.